I did a post recently for Ham Havarti Pinwheels and wanted to share with you another. Amber, our daughter is a big fan of turkey and cranberry together, one of her favorites. So I made these with her in mind, Cranberry Turkey Pinwheels! We took these on a picnic with the other pinwheels I made and they were a complete hit! These pinwheels would be great at anytime though and would be a party smash around the holidays!! Dried cranberries add tons of flavor and tang and of course are so easy to use. 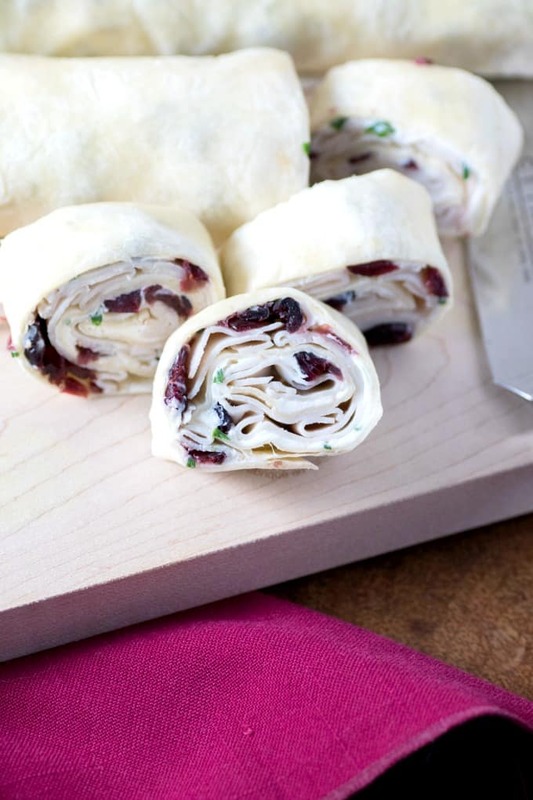 Rolled up with turkey, cream cheese and chives they make the perfect combination of flavors. These would also make a great lunch box sandwich and a couple of rolls go a long way. They can be made the night before and wrapped well in plastic wrap, then sliced and placed in a lunch box or served up on a platter. 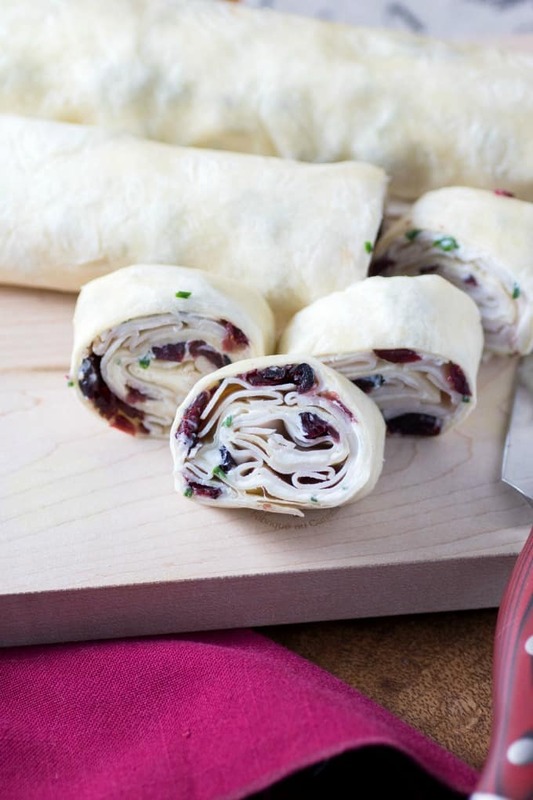 These cranberry turkey pinwheels will be gobbled down in no time. This recipe can be easily doubled or more for a crowd. They make a great appetizer to serve and everyone loves them too. Serving them over Thanksgiving and Christmas would be ideal and they are festive with their red and green colors. But they go wonderfully on a hot summer day also, very versatile. So when is comes to an easy dinner, lunch, appetizer, snack, or event these pinwheels can’t be beat. They would work just as well for game day too. Have a couple wrapped up and on hand to just slice and serve! They take only 5 ingredients and no effort but everyone will be impressed! I love that! So easy and you get all the credit. 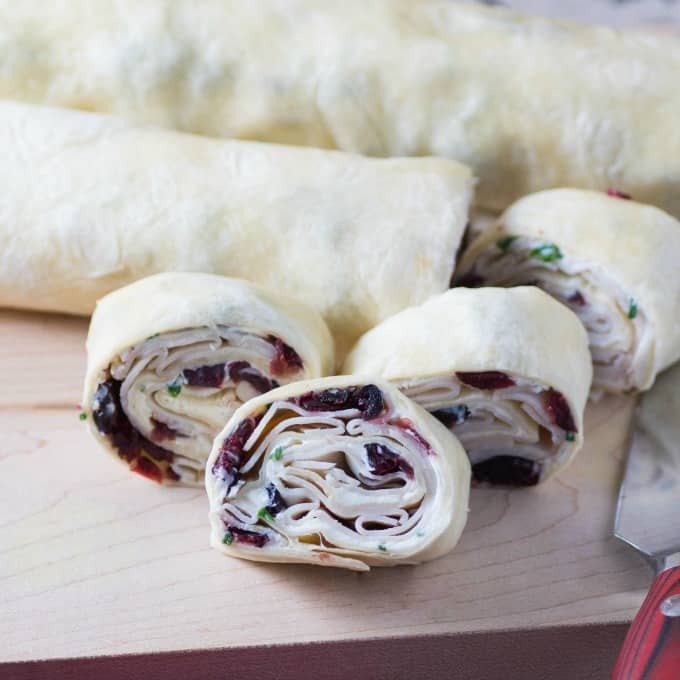 These Cranberry Turkey Pinwheels work fantastic for a picnic, or a lunch box hit or a holiday appetizer! They are great to make ahead and are easy to create with only 5 ingredients. Mix the cream cheese with the chives and spread over the two flour tortillas leaving about ½" from the edge. Sprinkle on the cranberries dividing between the two tortillas. Top with sliced turkey keeping 1½ inches from the one edge. Roll towards that edge. Refrigerate for at least 30 min. wrapped well in plastic wrap and then slice into 1" pinwheels. Love that these pinwheels are versatile as it wouldn’t be weird to make them without a holiday being in sight. I think a lot of people would really enjoy the cranberries. They look really good and easy to make. My daughter eats cranberries year round, she just loves them and they are so good for you too!! Those look absolutely delicious. Turkey and cranberry is such a classic combination. This will be in my belly this weekend. These look yummy. My favorite part of Thanksgiving leftovers are cranberry sauce, turkey sandwiches. These look yummy. These look amazing! I’m craving these now! I can’t wait to try this recipe with my family! I’m definitely interested in that cranberry flavor. I bet these are super tasty! What a great idea! Those look delicious! Never thought of using cranberries and turkey together like this! Thanks for the idea! These look so good! I know that I could probably easily make them after the holidays. What a great back to school lunch option! My son loes turkey rollups so these would be right up his alley. Can’t wait to get my hands on some sweet cranberries to try this! I adore cranberries! I love them in anything! These pinwheels are so easy and I know I would LOVE them! These look SO good! A sure hit at parties!! These look really good. This would be nice to have for some guests. I’m thinking for a party would be a great idea. Cranberry is seriously my favorite condiment. Yes I called it a condiment because I love them with everything! These look delish! These Cranberry Turkey Pinwheels looks so yummy. I am sure they will be a popular lunch idea in my house. I will have to give them a try this weekend. What a yummy combination! Makes me think of Thanksgiving. Cranberries and turkey – what a perfect pairing! These are something parents and kids could enjoy together for an after school snack. Pinwheels are one of my favorite food groups but I haven’t had one like this. Perfect way to use up Thanksgiving leftovers! My kids love pinwheels! They are such a really neat idea for foods, you can roll anything up in there and it tastes super good! I love the idea of Cranberry turkey pinwheels. I am going to have to try these for an after school snack for the kids. I made these Tara! They were really good. Thanks for making them and taking the time to tell me, I am so glad they were a hit! !